Drive is a film that follows a virtually mute man who drives stunt cars for movies. Yet we focus on his night pastime, where he moonlights as a for-hire escape driver for crooks. He does this because it would seem that his day job is essentially fake and he requires something more substantial and 'real' to express his timid self. He winds up falling in love with a girl who feels threatened by some goons, so the driver takes on the responsibility of protecting her. Although this would seem like a fast-paced, charged-up action flick, the director focusses on the small, slow moments rather than the few and far between action beats. Yes, there are a few fantastic chase scenes and the 18A rating kicks in at the half-way mark, but overall this is what people consider a 'Slow Film'. There are plenty of minutes that go by with people staring of in the distance but these are handled with an undercurrent of intensity. This develops a great atmosphere of darkness mixed with suave filmmaking. 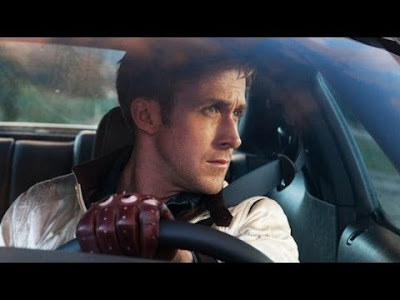 Stylistically, Drive is part film noir (anti-hero, femme fatale, tone) and part 70s B-movie action flick (his outfit, violence, the music). To relate it to other movies, I found Drive to be very similar to Taxi Driver. It could be a companion piece or homage: thematically, the main character's motivations, the opening credits and Albert Brooks was in both films playing virtually opposite roles. Speaking of which, the cast was a phenomenal group of recognizable character actors who provide visual familiarity to otherwise standard side characters. We look forward to seeing and hearing them since the main character rarely talks. The 80s style score is also pleasing with a flair of electronica, despite the lyrics which are often too literal. Summary: There are some wonderful scenes (the opening, the elevator) that set the bar very high, and there's great atmosphere. But the slow pace, dark material and lack of dialogue can quickly turn someone away from the film. Like the director's previous film (Valhalla Rising, which made my top 10 from last year) Drive is a powerful film that lacks rewatchability. This movie is not for everyone, but it may be right up your alley if you want a bold and stylish mood piece. It's #290 of the 1616 movies I've seen. [on flickchart.com].